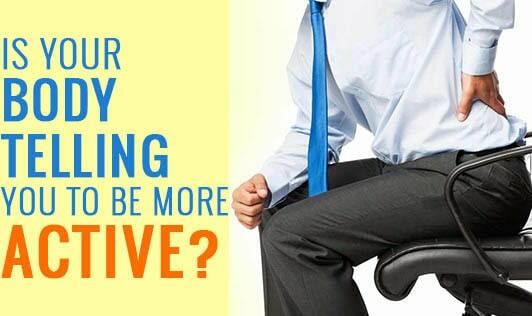 Is your body telling you to be more active? We often consider ourselves physically active when we do small activities like walking to the store and climbing a flight of stairs. No doubt, these activities are good. But are they enough for your body? Check for these signs which tell you that you need to be more active. Low appetite: Exercise regulates and increases appetite. A lack of appetite is a sign which tells you that you need to be more active. Bad posture: Good posture requires strong postural muscles. If you are having a hard time maintaining a good posture, your muscles are probably not as strong as they should be and need strengthening. Don't sweat much: Sweating is a way to cool your body. People who are physically fit have a better cooling system, meaning, they sweat better and faster. If you don't sweat much while exercising, it is an indication that you need to be more active. But always consult your physical trainer before increasing your workouts! Weight gain: Although diet is an important factor in weight loss/gain, lack of exercise is also a factor which contributes to unhealthy weight gain. Fatigue: If you're feeling fatigued by the end of the day and feel like sleeping rather than doing something, it's time you start exercising. Heart rate: After climbing stairs or walking, if your heart rate increases considerably and takes a long time to come back to normal, it is a sign of bad physical condition. Stressed out: Exercise has been found to calm you and keep your stress at bay. If you're feeling stressed out most of the time, it could be an indication of low activity level. Have you noticed any of these signs? If you have, then it's time to grab your running shoes and start exercising!